A mere two hours from the buzzing epicenter of New York City, one can find peace in completely natural surroundings—and then be back in the city in time for cocktails at a swanky lounge. Here is one incredible New York city travel excursion that transports visitors to another realm—faraway, yet close to the towering skyline. For most, the name “Fire Island” conjures images of beaches, sand dunes, the spread of the Atlantic, quaint shops and restaurants. As New York City weekend escapees catch the Fire Island ferry to towns like Ocean Beach, Cherry Grove, and Fire Island Pines, they carry with them vestiges of the big city’s vibrancy—which is seen in some of the elaborate and raucous parties and nightlife that these Fire Island communities offer. However, for those seeking a unique Fire Island travel sanctuary, wedged between the flamboyant nightlife of Cherry Grove and Ocean Beach lies one of the few maritime forests left on the eastern seaboard: the Sunken Forest. 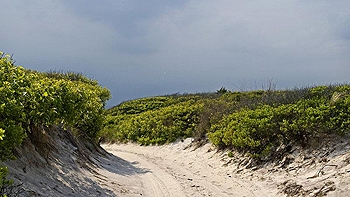 Sunken Forest is located next to Sailors Haven, a great Fire Island day trip destination. It features trees that have been twisted and shaped by the constant salt spray, freshwater marshland, and abundant wildlife. It is a perfect place to get out of the sun and take a peaceful stroll. Guided tours are available during the summer months. Maintained by The Fire Island National Seashore, Sunken Forest earned its name because it appears lower than the surrounding water. The forest is not actually below sea level; the high surrounding sand dunes that protect this environment create the illusion of being lower than sea level. Sunken Forest is snugly nestled between two sets of sand dunes, the protection of which allows this placid wooded refuge to exist. Due to exposure to harsh, salty winds, trees do not usually fare well on narrow barrier islands like Fire Island. Parts of Sunken Forest appear as a surreal Halloween dream, with shrunken, twisted trees kept at a uniform height of 20-30 feet by the ocean’s salt spray. The result is a truly singular canopied 40-acre wilderness, through which miles of well-maintained boardwalks meander and wind. For hikers, explorers, and naturalists, Fire Island’s Sunken Forest is an alluring New York state travel destination. In the off-season, when crowds dissipate, Sunken Forest possesses an especially potent magic. Standing outside the forest’s entrance, where the boardwalk disappears into a yawning opening in the trees, excitement and curiosity follow. The first step into the shady grove urges silence. One can sense wildlife, but a hush fills the air. Progressing deeper into the Forest, nature’s music strikes up, once the inhabitants sense you mean them no harm. You can walk for miles up and down the roller-coaster boardwalks that carry you over two rows of sand dunes. In Sunken Forest’s depths, keen-eyed naturalists will recognize the American holly, sassafras, and shadblow trees that make up the oldest continuously growing forest on Long Island. Some trees are estimated to be well over 200 years old. Other plant species like the winged sumac, bayberry, blueberry, wild grape, bearberry, and poison ivy color the forest floor. Wildlife watchers will be thrilled at the 300 species of birds and may even catch a glimpse of deer, red fox or raccoons. Serious hikers, bird watchers and ecologists find this part of Fire Island to be absolutely fascinating. With several ecosystems, there is plenty of diversity in the flora and wildlife. While walking through the forest, be sure to look up; the twisted canopy is the forest’s most intriguing attribute. Sunken Forest can be reached by the Sayville Fire Island ferry to Sailor’s Haven during the summertime. At other times of the year, the closest Fire Island ferry stop is at Cherry Grove, a mile east. Once at Cherry Grove, you can walk up and down the two rows of sand dunes that shield the forest on a boardwalk, and then take the Sunken Forest Nature Trail, a 1.5 mile boardwalk that winds through the multiple ecosystems in the forest. And while you’re there, take a water taxi to the other communities, for a true flavor of the island. For information about reaching the ferry terminal from New York City via Long Island Railroad (which is an especially convenient and affordable way to get there) go to www.mta.info/lirr/. You can also take a car service or drive to the ferry, at 41 River Road in Sayville, New York. There’s a long-term parking lot across the street from the ferry terminal, and the charge is $6 to $7 per day, depending on the day of the week.